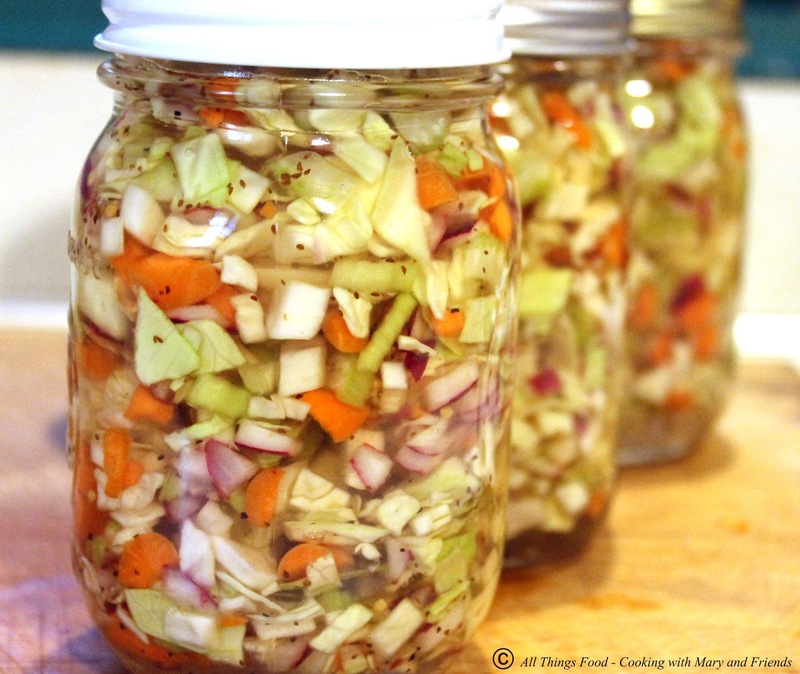 When cabbage is growing in abundance in your garden, or you simply want some great coleslaw, mix up a batch of this Pickled Cabbage Slaw. It can be enjoyed fresh, or you can "put some up" to use another day. This recipe is exactly the same as Grandma Joan's Coleslaw, only I rough chop it, and of course, no mayonnaise is ever added if you are canning it. Does it stay crunchy? You bet it does! Rough chop all vegetables and place in large non-reactive bowl (stainless steel or glass). Sprinkle liberally with Fruit Fresh to keep veggies from browning. In a large saucepan, combine sugar, vinegar and next 4 ingredients. Stir to combine and bring to a boil. Stir and allow to cool slightly. 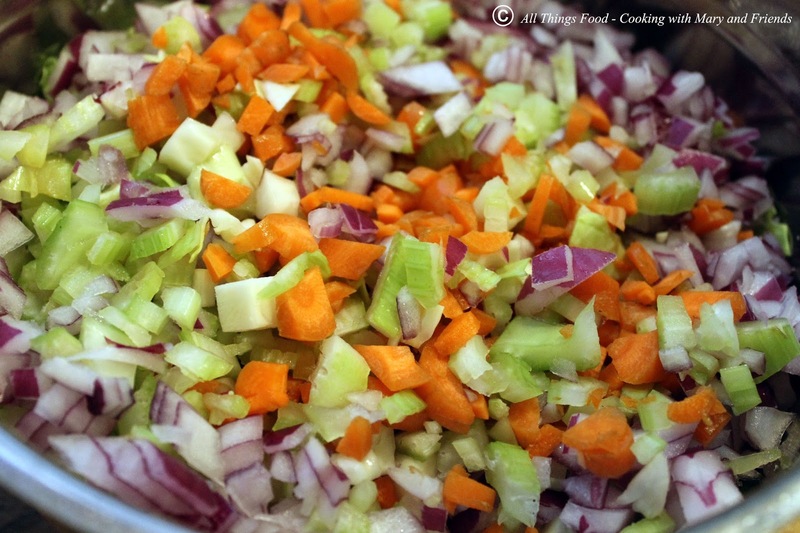 Once cooled, stir sugar/vinegar mixture into veggies and toss to thoroughly combine. Let sit a few minutes and mix well. 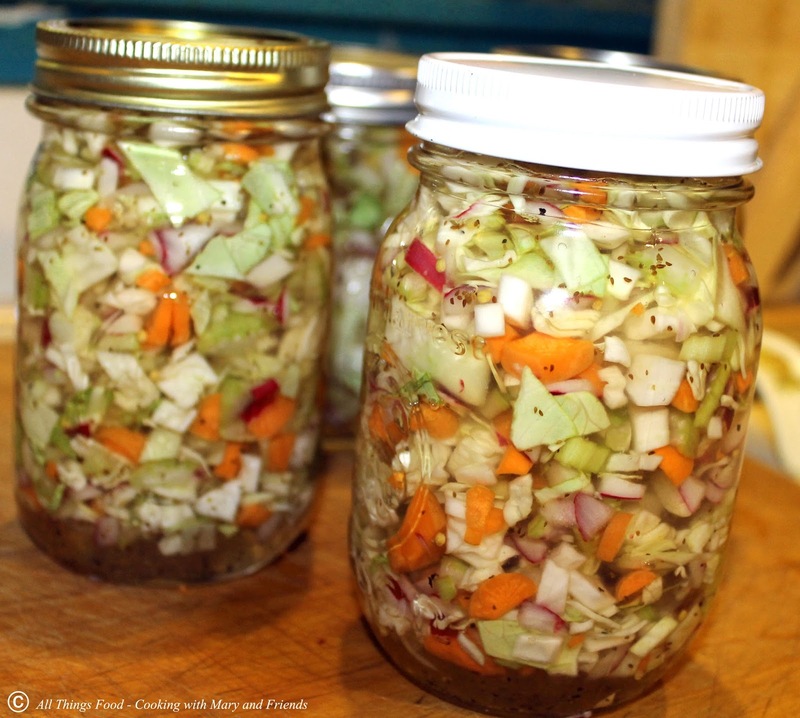 Using a slotted spoon, pack coleslaw fairly tightly into half-pint, pint or quart canning jars and cover with brine leaving 1/2-inch head-space (make more brine if you don't have enough to cover). Process jars in boiling water bath; half-pints and pint jars 10 minutes; quarts 15 minutes. Remove jars from water bath and let cool on your kitchen counter-top 24 hours undisturbed. Jars are sealed when button top on lid is fully depressed and can't be moved. Store jars in pantry up to one year. Open jars need to be refrigerated. Cooks note: Veggies may "float" some in the brine after canning; this is completely normal and the coleslaw will settle down once the veggies cool and the jars are sealed. Yield: 1 small head of cabbage yields 4 pint jars of coleslaw. Recipe is easily doubled. Serving: Serve as is, or pour off some of the brine and stir in some mayonnaise for a creamier texture. Top on Hand-Pulled Pork Barbecue Sandwiches for a delicious treat.